Here is a brief story of where our cartoons come from. Kale Crusaders Headquarters is located down the street from a tiny Whole Foods Market. Given the postage stamp footprint of this particular store, we were recently surprised to discover a new-to-us-vegetable: Parsley Root! P.S. 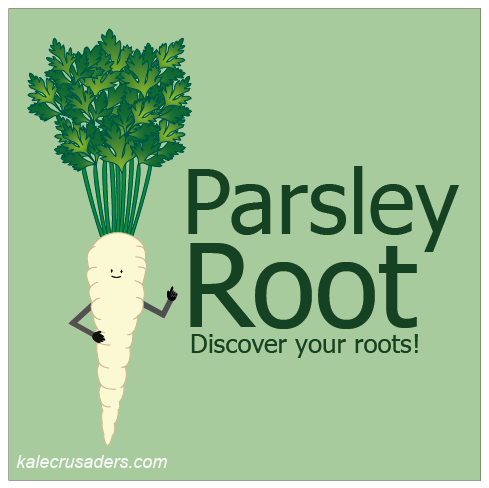 Similar to Parsley Leaf, Parsley Root is full of antioxidants, vitamins, and minerals! 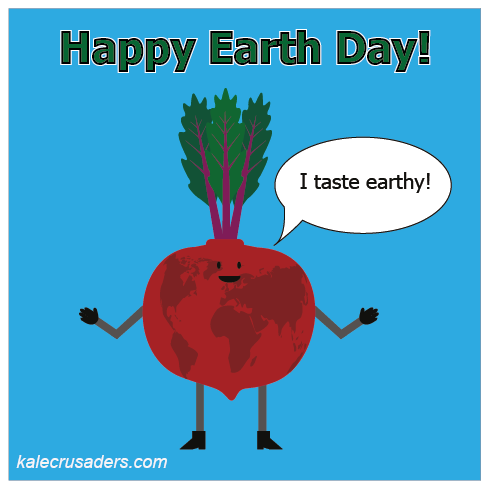 Happy Earth Day everyone! In honor of all things green and earthy, we are featuring three beet salads. Happy Passover to those celebrating! The Kale Crusaders' first exposure to Horseradish involved a jar of the fuchsia-hued variety. Little did we know until much later in life that Horseradish came from a gnarly-looking root and tasted much spicier without the added beet pulp. Want to make your own at home? Lisa Goldfinger at Panning the Globe has got you covered with her Fresh Horseradish with Beets recipe! P.S. 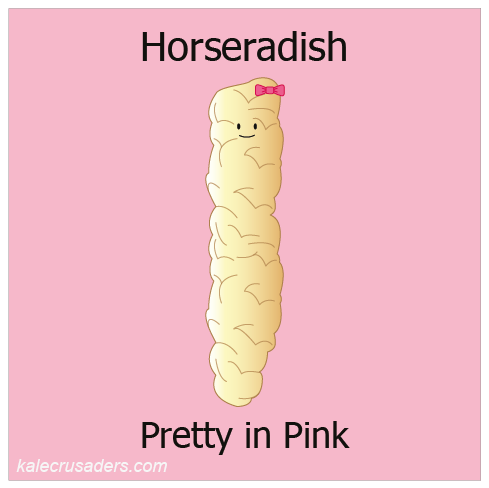 We resisted the temptation to deck out Horseradish in the iconic Pretty in Pink prom dress. 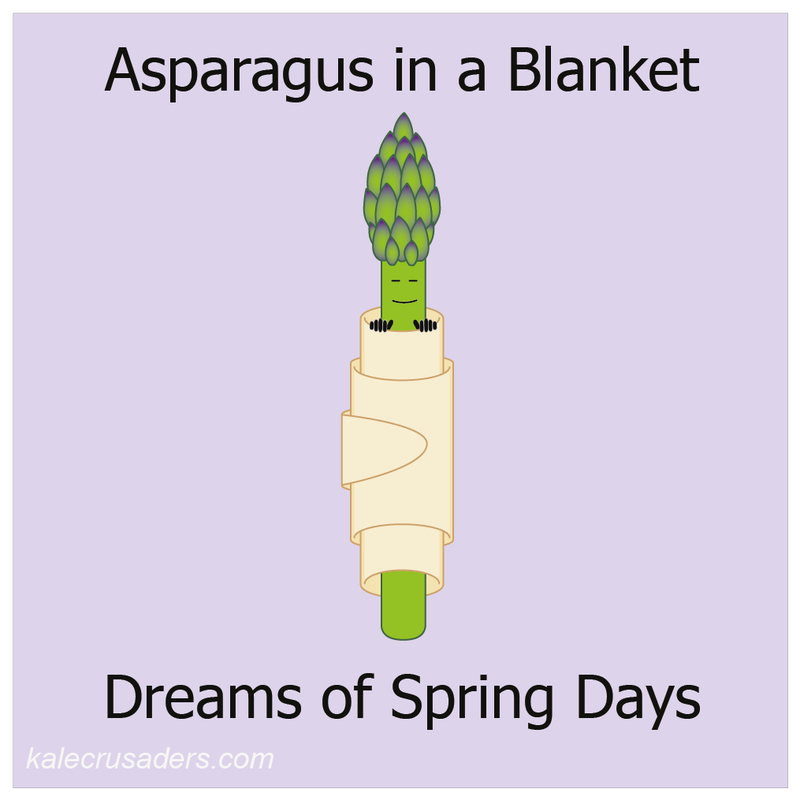 Asparagus is coming out of hibernation to celebrate all things spring. Leave the piggies in the barn and indulge in Asparagus in a Blanket (substitute the butter and egg for a vegan snack) by Cathy Erway of Not Eating Out in NY. P.S. If don't feel like rolling out your own dough, rumor has it that there are some "accidentally vegan" crescent rolls and puff pastry sheets in your supermarket. P.P.S Any idea how to pluralize asparagus? Asparagus? Asparaguses? Asparagi? Eugene Wu is back with our April Fool's Day Cartoon! Kale and Kiwi are easy to mix up. 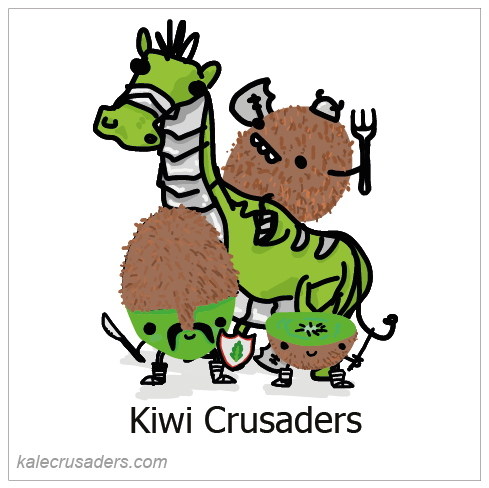 Kale is green but turns brown over time, whereas Kiwi is brown and green inside. Both crusaders are after the same goal: healthy meals and a full Plate of Food. Riding their fine steed, which is a a mix between dragon and horse, they're out to deliver children a nutritious and scrumptious course. But really, why should you have to choose a favorite? We propose that you say cheers to April 1st with a Kiwi Kale Smoothie by Jordan Cord of The Fitchen and Kiwi Avocado Kale Salad by Heather of Gluten-Free Cat.